Today’s Practice Card Sets include 52 different practices that support you being in your light and power. They are simple exercises, meditations and reminders that can be done in just a couple minutes. 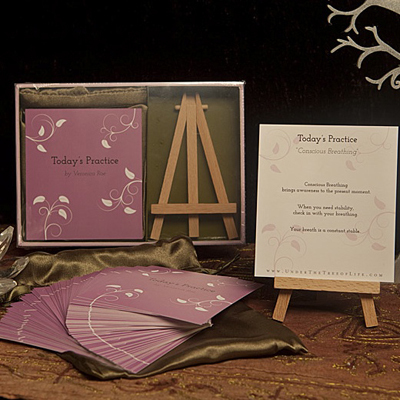 The set comes with a mini 5 inch easel that sits great on your desk at work, dresser, nightstand or altar. The cards hold the intention to give the reader exactly what they need in the moment they read each one, and what is received from a given practice may evolve and change over time. I often experience pulling the exact practice I need right when I need it! And sometimes I will pull the same one over and over again, even when the deck has been shuffled. A gentle reminder no doubt, that I am still working on that very subject!